Although they will not see prices, your Buyers or "potential" Buyers can see your products for your Showroom without logging in. And, based on what they see, they make decisions about whether they want to represent your Brand. As illustrated below, your Showroom Season Display order may not be working for you as described in Buyer Accounts - Getting Started. You may have old Seasons displayed. Or, Seasons without cover images. You may simply want to display for your customers the most popular seasons first. If the Show in Showroom is set to "No", the Season will not be displayed in your Showroom. Or, if it is marked as "Hidden". To change those settings, click on the edit icon (pencil) at the end of the Season's row. 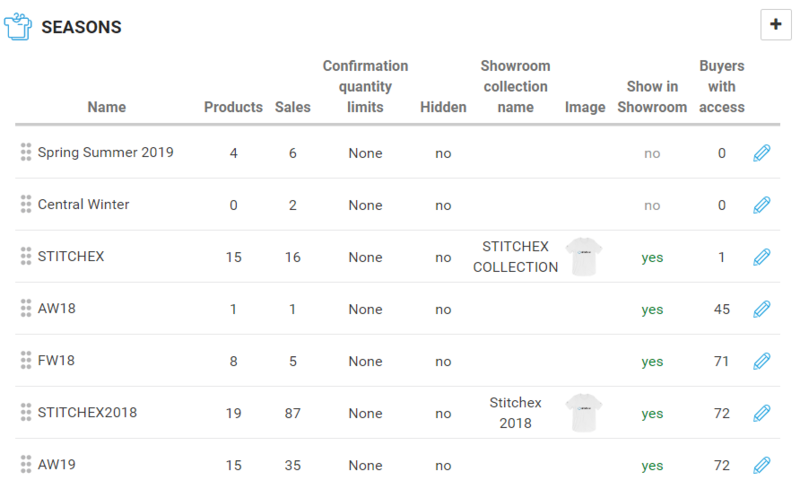 If your "Configuration" (Showroom>Configuration) in your Showroom is set to display only "Available to Sell" or "In Inventory", Seasons listed at the top with "Show in Showroom" set to "yes" but have zero inventory, will not be displayed on your Showroom. See our Knowledge Article on Managing Seasons for additional information on how to set cover photos for your seasons.